The mainstream adoption of smartphones has brought with it many benefits. As well as putting the internet in your pocket, communicating with others has never been easier — that doesn’t just mean text messages and phone calls, but location sharing too. As a parent of two young kids, I think LG is on to something with its KizON wearable device that gives mums and dads the peace of mind that comes with knowing the location of your child. But shouldn’t it be easier than strapping a device to their wrist and hoping that they wear it, don’t lose it and don’t break it? That’s where Folr, a new company in Singapore, is hoping to make a difference with its apps for iOS and Android. My kids are both under six, so are too young to own smartphones, but the service is aimed at older children and other members of the family. I can imagine it would be useful for my parents to keep up with my grandfather — he’s 91 but owns a smartphone, which is clearly the key factor here. Folr founder John Fearon assures me that the service is entirely permission-based, with the aim of giving you peace of mind about the location of those you love, rather than stalking people. For now, it is primarily targeted at families, he says. The app is very simple. You sign up and verify your account using your phone number, and can then request to “follow” others using your phone’s address book or by entering their number. Any person you add must then consent to let you follow them — they can also select exactly what days and times that you have access to their location. The app is free to use, and will show you the current location of those who you are authorized to follow. 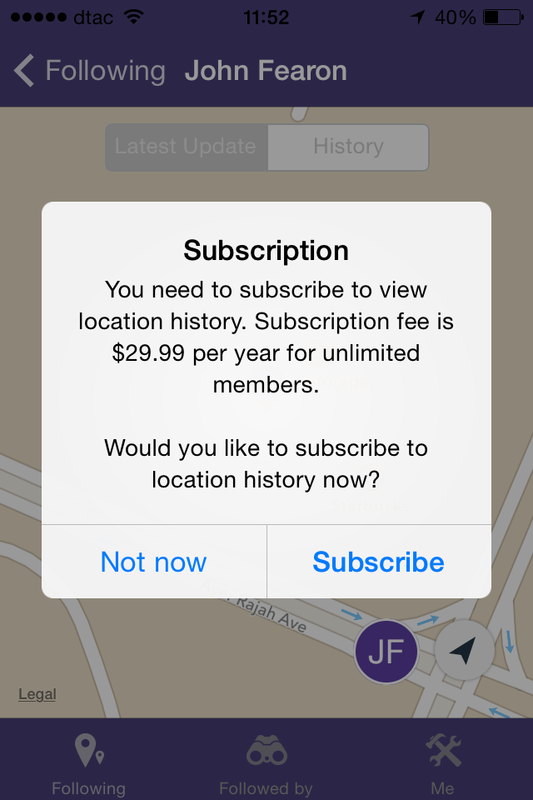 There is a $30 annual subscription — unlocked via the app — which grants you access to a person’s history of log-ins. The idea here is that you pay to be able to see where your child, elderly parent or perhaps spouse, has been during any given day, week, etc. Fearon — who also founded cloud storage service Dropmyemail — believes that Folr has considerable value beyond just covering families. “In the future we also plan to work with companies to help track their staff while at work and there is also the school attendance angle. We believe there is a big market for an app that can do permission tracking,” he told me, while I tracked his location with the app. As for the data, Fearon says it is held on Amazon Web Services in Singapore, where it is encrypted. The basic concept of following people around is creepy, but I do agree that there is value in permission-based tracking — particularly for children — when you consider the sheer number of connected devices that people carry with them today. Of course, teenagers and others in a rebellious mood could deactivate their location, but that’s where it is down to parents to drive a bargain or have their child realize the importance of the service. The app has just come out for iOS and Android and is available worldwide.